You've gotten your SharePoint 2013 Social features up-and-running, but want to understand how everything works under the covers? Join us in this session and learn about our architecture, storage model, and what it takes for activities across SharePoint to appear in the Newsfeed. 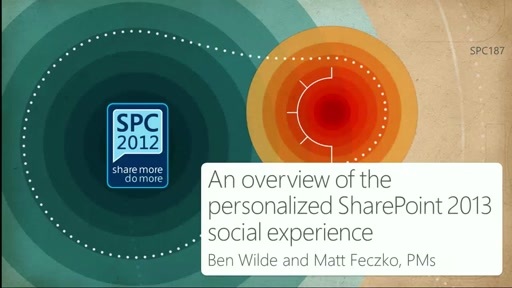 We'll look at a variety of example posts that you may see, and talk about how we generate, store, trim, and ultimately create the rich social experience of SharePoint 2013.